United Church of Hyde Park has held down the corner of 53rd and S. Blackstone since 1889, with a congregational history that goes back even further. 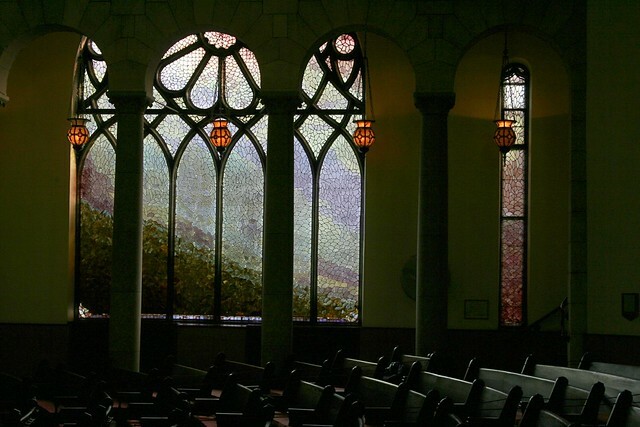 Architecturally and historically, there is much to say about this venerable church building. On the outside, the church is not that different from any of the dozens of gray stone church structures that dot the Chicago landscape. It is a free interpretation of the Romanesque style, adapted to an urban corner site and dressed up with touches of French Gothic. 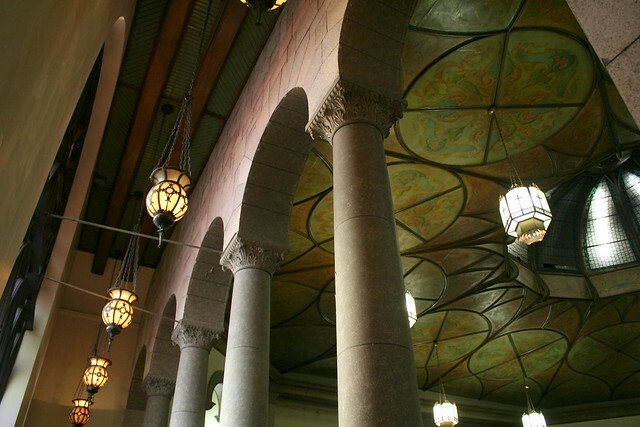 Round arched windows, round engaged columns, thin bands of organic ornament, and shear stone walls that rise up without setback or articulation put it in the same vein as Sullivan’s Auditorium Building and HH Richardson’s Glesner House, both close contemporaries. The church responds handsomely to its corner site, placing the main entrance on the corner and marking it with the bell tower. The current tower roof is a sadly simplified replacement for the elaborate original (see a photo on the Hyde Park Historical Society newsletter); a plain copper panel testifies to the engaged micro-turret which once ran up into the tower’s upper level, today shorn off at the masonry line. 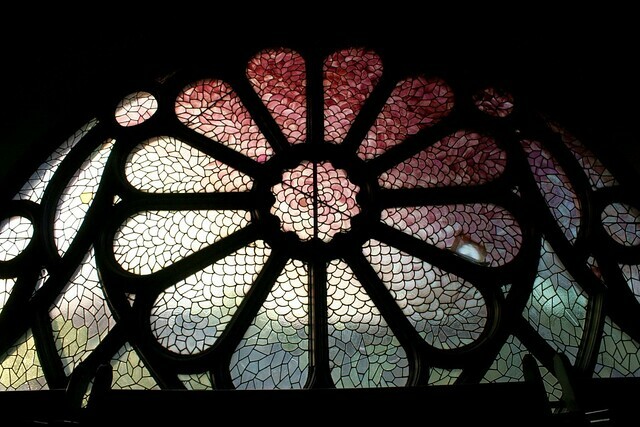 Inside, the sanctuary is a surreal departure from the steady American-grown Romanesque exterior. A flat ceiling marked by curving, looping plasterwork and an Egyptianesque colonnade around the perimeter of the sanctuary tell of a space that has been radically changed from its original configuration. 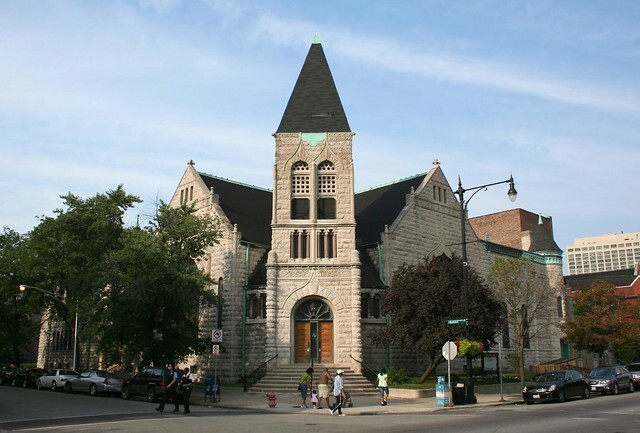 Per the church’s own website, the church has roots going back to the earliest days of Hyde Park, beginning as a meeting of residents around 1858 and eventually organizing as the First Presbyterian Church of Hyde Park in 1860. Moving from their original site a few blocks east, the congregation put up a conventional French Gothic stone building at 53rd and Blackstone in 1869. 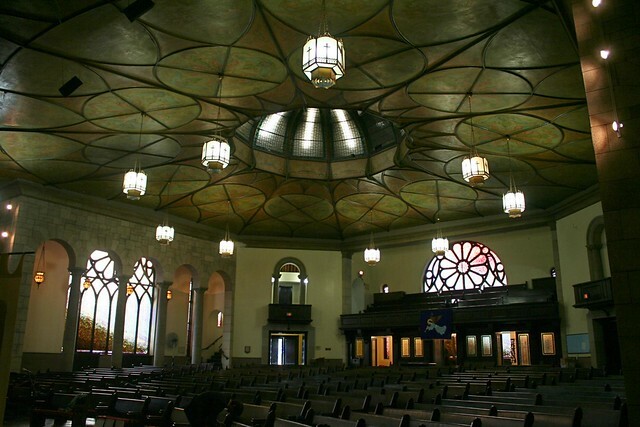 It was soon too small for the growing congregation, and was replaced by the current structure – erected in 1889 to the designs of architect Gregory A. Vigeant. A 1923 remodeling significantly altered the interior, bringing it to its current form. Additions to the space included the balcony, the colonnade, and new flooring to work with the church’s Skinner organ. I would also assume that this is when the flat ceiling was added, as Victorian churches unfailingly went for the more dramatic effects of exposed wood structure and high pitched ceilings that followed the exterior roof. The whole thing comes together as a sort of surreal Spanish Romanesque fantasy. The ceiling dome is a particularly curious specimen. Because the flat ceiling so dramatically lowers the ceiling height, the dome is actually deeply sunken within the roof structure. 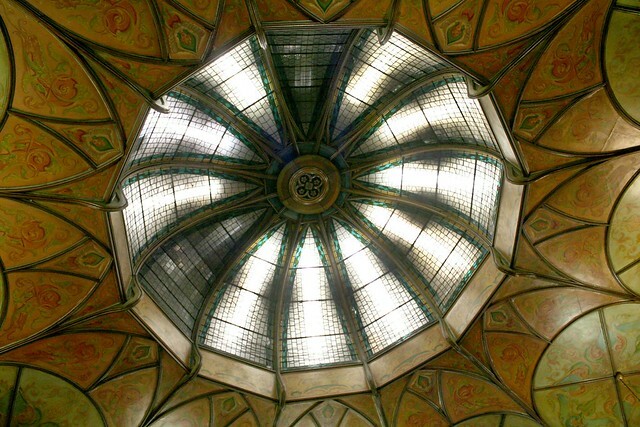 Above, there is presumably a column of empty enclosed space, originally topped by a skylight; today the skylight is gone or blacked out, and fluorescent bulbs light the dome from above. 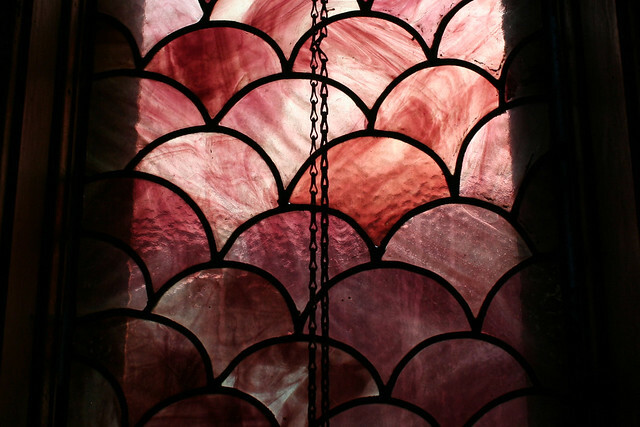 The stained glass in the sanctuary is unique – an Impressionistic assortment of hues ranging from clear through murky greens and sunset purples, all rendered in overlapping fish scales of glass. The style adds a distinctly Shingle Style air to a church that is already pulled in several other architectural directions. The congregation merged with that of Hyde Park Congregational Church in 1930, and with Hyde Park Methodist Church in 1970 amidst a radically changed neighborhood. Today it’s an integrated, open congregation that strongly reflects the progressive influences of nearby University of Chicago. 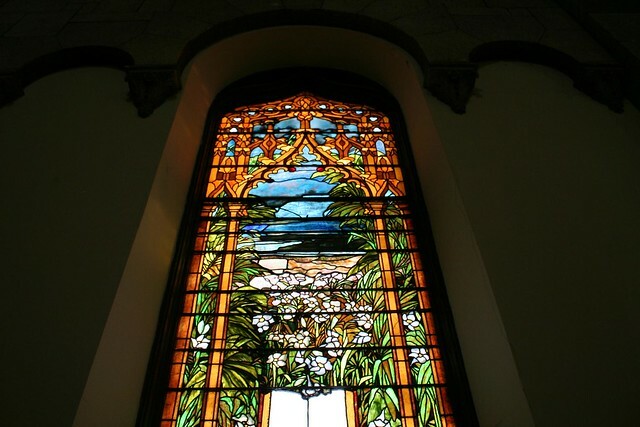 This entry was posted in historicist churches, Hyde Park, Pre-war churches, Stained Glass. Bookmark the permalink.